“WATCH Alves! “ “Watch Alves!” These words stuck in my mind. On those early open trials, as soon as I took up my position on one of the observed hills someone made this remark. The name was familiar. A-L-V E-S, pronounced as it is spelt and not, I gathered. as if the latter part rhymes with fez. As later I was to realize, the reason it was familiar was that I had written ‘P. H. Alves” more than once in connection with trials pre-war. I did as I was adjured; I watched for Alves. Unfortunately, on the Colmore and Victory the only occasion on which I saw him was at a spot where one lingered hoping that the impossible would be achieved – that some rider would find a patch of “hard” amid the slime and, if not win through, get at least a few yards up the hill. Alves, I noted, did everything in copybook style. Had there been the slightest wheelgrip he would have made full use of It. And it was apparent that he had an eye for country – knew which of the many possible paths gave the slightest chance of success. When, later, an enquiring manufacturer sought an opinion on the riding of one P. H. Alves, the scribe to his chagrin could only give but a partial answer. However. the results of those two trials gave a good one: Colmore Trial. – Horton Cup (250-350 c.c. ), P. H. Alves (350 Velocette). Victory Trial. -Henley Cup (best 350 c.c. ), P. H. Alves (350 Royal Enfield}. Small wonder that there had been all those comments of “Watch Alves!” from trade as other enthusiasts; many important pairs of eyes were on him. Photo – a pre war picture that causes the query whether bumper bars would become popular for rough riding. 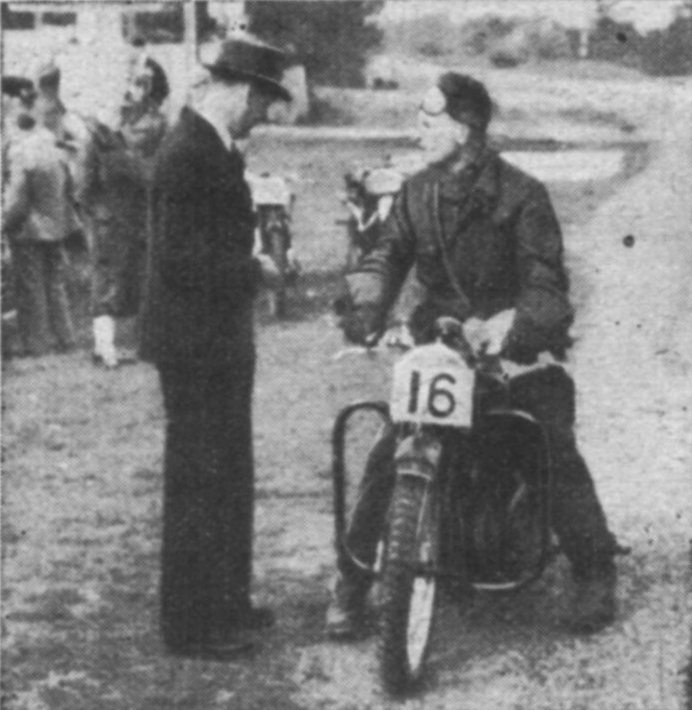 Alves and his Velocette and the start of the 1938 Stroud team trial. Since then, of course. Alves has come very near to sweeping the board on the 350 c.c. Triumph twin, making best solo performance in no fewer than three of the four open trials in which he has ridden. From the different make of machine you will have gathered that his life is not spent in motor cycle manufacture. His sole connection with the motor cycle trade is that he is riding for Triumph in trials. His debut as a trade-supported rider occurred only this year; how did it come about? – what gave him his chance? The facts are interesting, and may form an eye·opener to enthusiasts who are hoping that one day they will be “lucky.” There are quotation marks round that last word, for it is not luck which brings a man to the top of the trials game, whatever the man concerned may say. The reason why I heard all those comments about the quiet, retiring Mr. Alves was that eyes that mattered had already noted his riding. While manufacturers support trials there will always be eyes on the look-out for outstanding talent. There is no need to be connected with the trade – no need for anything other than riding skill, knowledge, the application of that knowledge and the right temperament. Anyone who enters trials has his chance. and it is not always necessary to enter for the really big competitions. Alves’ ability was spotted in Home Guard events; Triumphs had words with him then. However. let us trace matters in their proper sequence. Percival Harold Alves was born in Glastonbury on January 2nd, 1916. which. of course, makes him just over 30. That he is mechanically minded – very much so – is demonstrated by the fact that when twelve years of age built a car, I wish I had a photograph of it, for it had a wooden chassis, an Auto-wheel engine as the power unit, a solid back axle and steering on the lines of that of a traction engine, but with Meccano gears at the lower end of the steering column and pulleys plus picture cord. Of brakes there were none; the tyres were solids. Starting was by pushing, Before the pushing, however, a nail was thrust under the throttle slid to hold it open. Once the engine had started and 12-year-old was aboard, he used the accelerator, at the same time: removing the nail. No, he never had the nail go in. The entire vehicle was made by young AIves except that the back axle was turned up by a local garage at a cost of 2s. 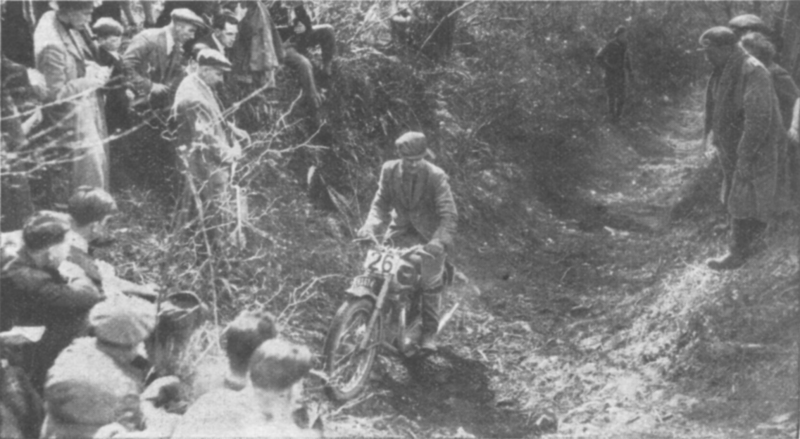 Photo – Alves and his Triumph Twin on Nannygoats Hill in the Mitchell Trial, in which he made the best performance. An interesting point is that although he is almost stationary, his eyes seeking the best path on the sharp turn, his hand is away from the clutch lever, such is the slow speed pulling power of the twin. Please do not laugh when I tell you where he drove his car. It was in the yard at the local police station. The plan was to push it down there whenever time and the car were ripe for a test. It was only about a quarter of a mile away, and Father was friendly with the Super. Barring the fact that the back wheeI, which was pegged to the rear axle, gave trouble owing to the hub cracking, all went well – until one day the sergeant’s baby was nearly knocked out of its pram. . . It was also when he was about 12 years of age that Alves had his first ride on a motor cycle. He rode his uncle’s 225 c.c. Royal Enfield round an Orchard and ran into a wall. However, it was not this little episode which brought riding the Enfield to an all-to-early finish, but that Uncle put pigs in the orchard. That was all the motor cycling until Alves was 18. At Easter, 1934. with accumulated savings, he got his first motor cycle. a. 2,50 c.c. overhead valve “Flying Cloud” O.K, Supreme. Father disapproved strongly, but paid the Insurance! Father was an architect and Surveyor in Glastonbury. and after leaving school Alves went into his office as an articled pupil. 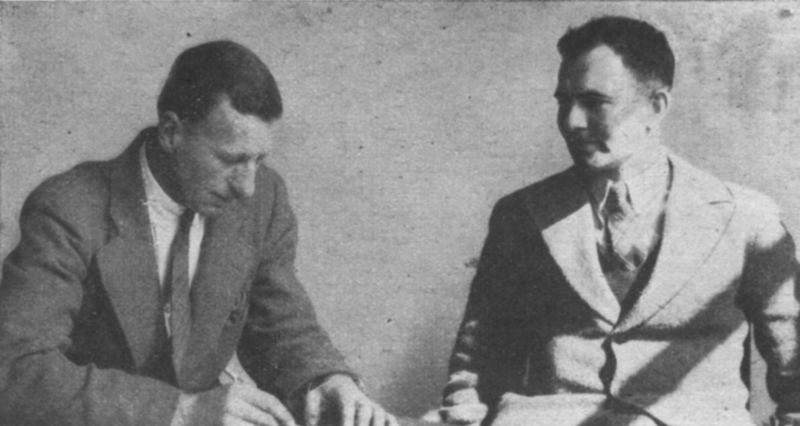 There he remained until April,1939, and then – already P.A.S.I. (Professional Associate, the Chartered Surveyors’ Institution) – he went into the City Architect’s Office at Exeter. A year later be joined the Building Section, Works Engineers’ Department, Westland Aircraft, at Yeovil. and in June, 1941, joined Humbers as building and quantity surveyor in the Architects’ Department; and at Humbers he is today. Thus, as is usual, competition riding is a sideline – a very, very pleasant one. While that sketches Alves’ business career very briefly, his motor cyclIng career is like the one some of you will have pictured for yourselves (or will picture after readings this article!). He had been bitten before he bought the Flying Cloud at the age of 18, Now that he had tasted motor cycling it was a case of one motorcycle after another. At the end of three months he bought a 1933 Blue Star B.S.A., a five-hundred, Then came a succession of Velocettes – thirteen of them, with a brand new 250 c.c. MOV as the first. He has had one o.h.c. Velocette, but his preference has always been for the push-rod models; he likes the urge these modeIs have at low rev . The early machines were used for touring, running about – yes and for tackling trials hills. Six weeks after getting the O.K. Supreme he was down at Porlock trying Doverhay. I asked, “Did you get up? .. and back came the reply in a tone of wonderment, “Yes, I did.” He was clean, too, it seems. He packed a good mileage into a year -about 12,000- and, at first, used to tackle trials hills on his own. It seemed that he could get up as well as some of the folk he watched on them, but he found then, even as he does to some extent today, that if he doe all right early on he continues to do so on succeeding sections, but if he messes up an early hill he’s had it! He feels better about it now, he says, but is still not entirely happy if things go wrong soon after the start. Like many another enthusiast. he read all he could concerning the trials game. For the rest, it was a case of learning by experience. He never, at least consciously set about studying the methods of others, but used to watch on the Colmore and one or two other big trials. 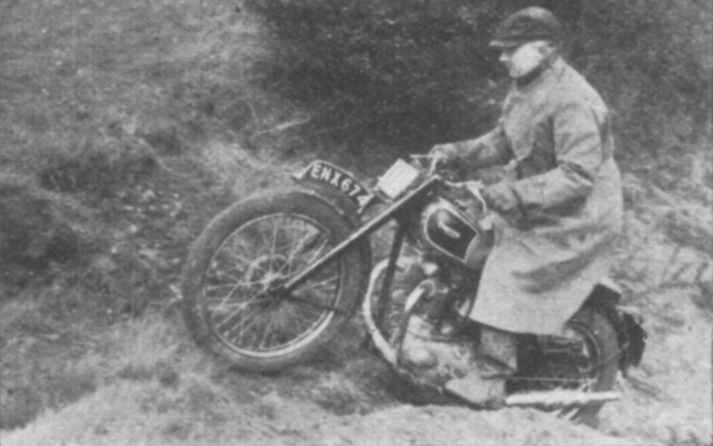 When he decided to have a shot at trials a difficulty was getting a sprocket for his Velocette which would provide him with a sufficiently low gear ratio. What he did was to buy a magneto sprocket with the desired number of teeth and have the boss of the sprocket bored out to fit the Velocette. Then, to get the necessary tooth width, he obtained a cycle fixed·wheel and attached it to the magneto sprocket by four soft-iron rivets. The softening previous to drilling he achieved by throwing the sprockets in the fire! A piece of chain around the two sprockets holds them in the correct relative position during the actual drilling. Although not hardened afterwards these sprockets, he says, seem to work all right; they are what he uses for scrambling. Another scheme, he says, is to use two fixed wheels as a template. Get a piece of steel that is of the correct width, bolt the sprockets one each side, and then cut the teeth with hacksaw and file. There is nothing on Mr. Alves in the matter of making do! The first trial in which he entered was the Cup Trial run by the Knowle Club, of Bristol, in February, 1937. It was reasonably easy – his words! – and, riding a three fifty Velo., he got through without loss of mark. There were six with clean sheets, and Alves lost on the Special test. However, having lost no marks, he got a first class award in his first event. “It did not go on like that.” he says. However, when one finds what happened in the Blackmore Vale invitation trial one i not so sure. In this he got the novice award, made second best performance and was the best Blackmore Vale member, and there was a cup for the first item and one for the last! In those days he was riding with full electrical equipment, but it seem that his knowledge of trials and trial-machine preparation was not exactly lacking. He was using competition tyres (which were, of course, allowed at that time), had mudguards with more than standard clearance and a crankcase shield which is the very one he has been using on the Velocette with which he made best three-fifty performance in this year’s Colmore. What had taught him the need for adequate mudguard clearance was riding along Somerset lanes in his pre-trials days and finding – often – that the front wheel was not turning. His first open trial was the 1937 Kickham. He did not do any good. His gear slipped out on Mount Pleasant; he fell in a hole in Rings Pit (” They alway say you should aim for water; I did! “), and he ended. the day with no award at all. The private owner carried on. Victory Trial, a second-class award. Mitchell Trial, no award. On the way home from the Mitchell he ran into a snowstorm, and a car, in turn, ran into him. His leg was broken and was in plaster for eight months. To-day it is half an inch shorter than the other, but he does not have to use different footrest position, and it does not affect him a regard poising or standing on the rests. At Christmas, he was back in saddle again. Now comes the explanation of the Velocette with bumper bars that appeared in various trials in 1938. The machine was Alves’ and the reason, of course, his leg. He had the shock, of his life, he says, when; following tbe Stroud Team Trial, he found he and his bumper-bar Velo. had blossomed forth in the pages of The Motor Cycle. So the tale go on, but without much to relate in the way of successes, which is not very surprising in view of the fact that he must have been hampered. at least mentally, by his leg. Stroud Team Trial, no award; West of England, a second-class; John Douglas. nothing. In addition, he rode in a few Shepton Mallet group trials. Then came that job in Exeter. and he sold his Velo. and got a Tiger 100. The latter he kept for two years. Then he got married, sold the Tiger 100 and kept a two-fifty Velocette. The war started and that was all the competition riding until the Home Guard days. These afforded a trial at Stroud, another at Cheltenham and a couple of scrambles. It was at one of these latter-be won both! – that he met Mr Jack Welton, of Triumphs . Mr. Welton was already thinking that Mr. Alves looked a very likely rider for after the war. . . Alves has not told me this , but one of those who made the remarks quoted at the outset was Mr. A. J. Welton. ‘Our industry – certain member of it – is not slow when it comes to talent-spotting. Post-war? There were those two 350 c.c. best performances I have mentioned. Had Alves been granted his wish the second cup would not now be his (though possibly another would be! ), for he asked Enfields if he might borrow a ‘Flying Flea, the one-two-five two-stroke, but after the Colmore result they suggested that he hould ride a 350 c.c. Royal Enfield. Much to his surprise, he says, he again got the 350 c.c. cup. Then, as you know. Triumphs having been in touch with him in Home Guard days, he started to ride the 350 c.c. Triumph Twin. First, there was the Cotswold Cups Trial. The twin, on its first appearance in a trial, made best solo performance of the day. The effortlessness of Alves’ riding was something at which to marvel. ObviousIy, his win was no accident. Here was a rider of superb skill and here was a machine which, in the hands of that rider, could beat all. Then came the Bemrose. For once luck crept in – badluck – and instead of the win which everyone expected in view of his riding, Alves came away with a first-class award. Flook, it seems, knocked over a section of wall; when Alves walked up the hill on which he was to lose marks – the marks that cost him the premier award – there were two paths, both negotiable, but on his riding up, there was no path and he landed on a rock, stuck completely. However, there were two more Springtime “opens” left – the Mitchell and the Beggars’ Roost – and he won both. Thus in four rides on the Triumph Twin he has a trio of best performances and one first-class award. What an achievement! A point which puzzled a reader at Easter was the name P. H. Alves in the programme of a grass-track meeting at Bristol. Scrambles, grass-track riding, trials – he enjoys them all. For grass-track racing be got hold of a 350 c.c. G.T.S. O.K. Supreme which used to belong to John Humphries. This was in road-racing trim when he bought it and has since been modified considerably. So if you see this great enthusiast riding a Triumph Twin in a trial one day and an O.K Supreme at a grass-track meeting the next, and winning in both, do not be surprised. I need not tell you to .. “watch Alves!” I hope one day, if you have not done so already. you will meet him; you will enjoy that, too. I visited Jim in the 1970s at his home in Saltash, Cornwall to research an article about his riding career in the sadly long defunct magazine, ‘British Bike’. Not many people realise just how instrumental Jim was in gaining acceptance for the little Triumph unit machines, initially the Terrier and then the Cub. Jim was supplied with an early factory Terrier for trials evaluation, and found it ‘hopeless’ in his words. “It was light, the motor was sound, but the steering had a mind of its own. Trying to ride it up a muddy rut was just down to luck. In the end I spotted that the forks were so flimsy – to keep the weight down – that they flexed quite considerably. Standing in front the bike with the front wheel grasped between your knees you could twist the handlebars easily six inches out of line at either end. Jim passed the information back to Meriden – where George Fisher (who had come second in the SSDT on a 125cc Fanny-B) took over the development and the results can be seen at most pre-65 trials in the land – the Cubs now dominate the sport!! Lovely recollection Deryck. I know you have many more keep them rolling in please.